*Editors note: thanks to all who have viewed, liked, shared, or commented on my previous post titled The Graveyard of Ambition. We are currently at 40,000+ views over the last 2 weeks and counting. More importantly I’ve received 50+ resumes from the post, a testament to Galwegians across the globe and how strongly they feel about their hometown. That is a quirky/confusing/fun/stupid name, how on earth did you guys come up with that? Earlier this week I was out to dinner with a team of executives from a US based software company evaluating Galway as a potential location to expand their presence internationally. We had a very engaging conversation around the pros and cons of the various locations they were reviewing (I tried my best to limit my overwhelming enthusiasm towards Galway so they didn’t think I was pulling the hard sell). Towards the end of the meal their CEO looked at me, somewhat puzzled, and out of nowhere asked, “How did you come up with the name SmartBear?” Thankfully in my time at the company I’ve been asked that same question, with various levels of confusion, approximately 62,476 times at last count. After rattling off my response he looked much more enthusiastic and said, “That is such a great story, it must be on your website right?” While we have a great About Us page, it does leave out a few of the more interesting pieces of the story. But look no farther inquiring minds, I’ve decided to post the story here. The following is your history lesson in the name behind SmartBear. It all started with Insight Venture Partners, a group of super smart bankers in New York. Well, sort of. It actually began with a group of super smart Russian developers. Well, that’s not really true either. The name SmartBear truly started in Austin, Texas by the super smart entrepreneur Jason Cohen (who has a fantastic blog titled http://blog.asmartbear.com/). But before we get to Jason we need the New York bankers and Russian developers first. In 1999, AutomatedQA was formed in Tula, Russia. Makers of the test automation tool TestComplete. Fast forward to 2007 when the company was seeing fast growth and increased market penetration against the likes of HP and IBM, and the group of super smart bankers from New York acquired AQA as an investment to further penetrate the software quality market. Just a few months later the same group of super smart bankers in New York came across the company SmartBear out of Austin, Texas. Founded by Jason Cohen, his team built a first of its kind peer code review tool called Collaborator. Realizing the two companies were very complementary in the software quality space, Insight decided to pair them together and recruited a new CEO in Boston to take over and ramp growth through building an inside sales team and leveraging next generation inbound marketing techniques. About 18 months later, in 2009, the group of super smart bankers (yes there is a theme developing here, bankers in New York are smart) bought Pragmatic Software out of Denver, Colorado, makers of the test management tool QAComplete, and folded it in with AutomatedQA and SmartBear. At this point our executive team realized we had a problem. Internally we were one company, selling the idea of ridding the world of buggy software through the various products we had acquired over the previous few years. But to the outside world we were three different companies with three different websites, brands, etc. By combining all three companies into one name not only did we firm up our brand but we also created a platform where we could fold in future acquisitions (the bankers in New York have not stopped working). In 2011 we added two more companies: eviware out of Stockholm, makers of the API testing tool SoapUI, and AlertSite out of Florida, makers of the industry leading web monitoring platform. And most recently at the end of 2013 we acquired Lucierna out of Barcelona, makers of an industry leading APM solution. So there you have it: AutomatedQA + SmartBear + Pragmatic + eviware + AlertSite + Lucierna = SmartBear, the leading provider of user centric application quality and performance management tools for software professionals. We are obsessed about software quality and helping the world build better apps. If you take one thing away from this brief history lesson, it’s to read more John Irving and make friends with a group of super smart New York bankers. Who knows what the future could bring for you. It is now September 2014, and the new supercharged SmartBear Software is poised better than ever to completely disrupt the world of software quality forever. Did I mention the new EMEA HQ we opened over the summer where we are currently building the next great inside sales team to capitalize on this momentum? If you fit the mold of the below job description, give me a call. We have exciting things going on in the west of Ireland. A place this beautiful couldn’t have such an ominous nickname, right? In and of itself the above banter wouldn’t be anything outside the norm, given the various types of characters that line Galway’s main street on any given day. What made me laugh however was the overarching theme that it touches on. Galway, The Graveyard of Ambition. I will never forget when I first heard the term. I was maybe 3 days in town, minding my own business at a favorite local pub enjoying a pint. I got to chatting with the bartender as he finished his shift, and after giving my backstory he closed the conversation with, “Best of luck to you lad, and welcome to Galway, the Graveyard of Ambition.” He then proceeded to walk away. My immediate reaction upon hearing this statement was a mixture of confusion, anxiety and amazement. What exactly did he mean? Was this a generally accepted term, or just a case of a local pint puller taking the piss out of a yank? I continued on my night without thinking much of it. A few days later I met a fellow software industry leader for coffee. In fact, in my first 3 months in town I set more than 20 coffee meetings. Everyone from potential new hires, to various service providers, partner companies, IT leaders, lawyers, and bankers. I wanted to get acclimated to the local business climate as quick as possible. I can’t say enough about how warm of reception I received from everyone I’ve met to date. Everything from offering tips on where to pursue top talent, to where I should be golfing on the weekends, the community has been fantastic. 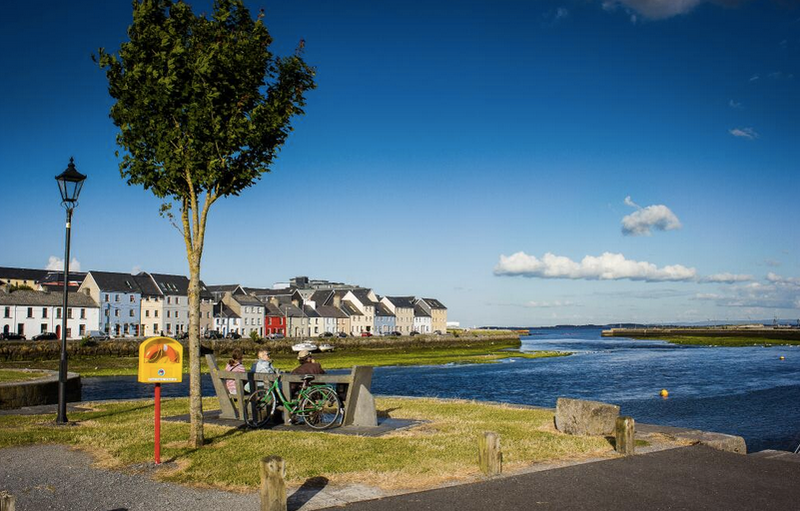 However, nearly every conversation also included reference at some point to this term, “Galway, the graveyard of ambition.” Even more surprising than the consistent use of the term was the apparent understated pride that locals would show when speaking to it. Most times I would walk back to my apartment after the meeting(s) thinking, wow that was a very nice, helpful person, but what is the deal with this graveyard of ambition talk? Did anyone on my team know this before we selected this town as our new EMEA HQ? How are we going to create and hire 100 jobs in a place with no drive or passion? Surely execs at companies like Cisco, HP, SAP, and Fidelity knew about this before opening their offices here, right? Right? Like any great Irish term there had to be a story behind it, and I needed to find out quickly or I knew my trip across the pond was to be a short one. A few weeks passed and I finally got an answer, and some much needed relief. In speaking to the head of one of the Big Four tax firms in town, he explained that the term dates back to the 1950s when describing the career path of a banker in Ireland. Legend has it that an aspiring banker would typically start out in their hometown, and then promotions would mean you get transferred to another location, and then another, and so on. The more cities you were seen moving through was a sign of “climbing the corporate ladder.” So someone might start his or her career in Limerick, move to Cork, then onto Galway, and hopefully someday get called up to HQ and the big city of Dublin. No we are not Dublin, London, or Amsterdam. We are Galway, and damn happy about it. And if you are reading this and interested in “burying your career” in the rugged west of Ireland, give me a call. We are hiring. A former CEO of mine was once quoted as saying, “A sign of a committed sales leader is that the last thought on their mind before falling asleep and the first thought on their mind when waking up is where they are in relation to their quarterly/annual target and what they are working on to close the gap / achieve success.” A bit extreme yes, but spend one day with a driven sales leader and you will quickly find that numbers rule the better part of our lives. For fellow sales pros reading, it’s ok, we know the career chose us and not the other way around. For what would life be like without the thrill / potential heartbreak of a quarter end chase? True to form, this morning I hopped out of bed, shocked that it was actually September 1st, held momentarily in contempt my US colleagues who would no doubt be sleeping in and enjoying their final day of summer (somehow in Ireland we skipped from spring right into fall weather without warning) and immediately started thinking about where we were as a team Quarter to Date against our target and what we needed to do to close the gap for what is always a challenging time of year for our business. -At any given point in their day they can be stopped and asked, “How’s it going?” (Irish versions being “How ya keeping?” / “How ya getting on?” / “What’s the craic?”) and the first response is an update on where they are in relation to their given monthly/quarterly/year quota. Personal life answers to the question are secondary. -They know exactly how many deals it will take for them to achieve and exceed their monthly/quarterly/yearly target. -They immediately know their average sales price and are actively trying different ways to more effectively increase by upsell and cross sell. -They always have at least 2-3 deals they are working on “in the background” that they won’t bring up publicly yet to avoid the potential jinx of a monster sized deal. -They immediately can rattle off who their top 3 customers are and can effectively package up their success stories when speaking to prospects in similar industries. -They know who their 3 key competitors are and can effectively speak to our competitive advantages. 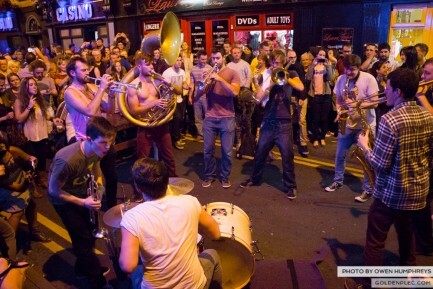 Street party with the Booka Brass Band as part of the Arts Festival.